Everybody's favorite fictional crime-fighting cyborg has made an appearance at a Detroit Tigers game. RoboCop threw out the first pitch at Comerica Park on Tuesday evening as the Tigers hosted the Toronto Blue Jays. An announcement said RoboCop's motorcycle was on display at the stadium and the first 10,000 fans were getting a RoboCop cheer card after getting inside. It's part of "RoboCop Day" in honor of the DVD release of this year's "RoboCop" remake. An announcement was to be made Tuesday about a RoboCop statue that's expected to be installed in Detroit this year, but that event and a police meet-and-greet were cancelled. A movement for the statue started in 2011 after a social networking campaign. The 1980s science fiction movie was set in a futuristic and crime-ridden Detroit. Critical thinking challenge: Why would people in Detroit want a statue of Robocop? Robocop the movie was enjoyed by fans everywhere. Its cool to see him making appearances. 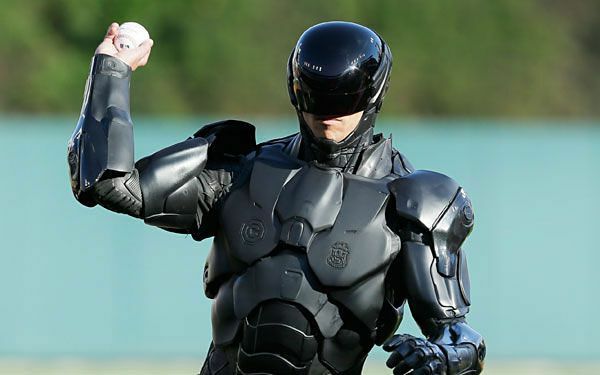 Its fun for both fans of baseball and robocop. It was a great idea to have him do it. A RoboCop statue could help many adults of this era shed some light upon their old memories. Some may look at it and smile and implementing this statue would be a great idea mainly due to the fact that it could help many reminisce. People would want a Robocop in detroit because the move took place in Detroit. It was based of a futuristic and crime-ridden Detroit. That's why people want that statue there. It makes quite sense actually. They would want it in Detroit because in the 1980s science fiction movie was set in a futuristic and crime-ridden Detroit. Which would make no sense to have a Statute in because it could take up space you could use to build other things with. In fact if their happened to be a tornado it would cause more destruction. why would people in Detroit want a statue of robocop in the city? i think that the people of detroit want the statue because the original movie robocop from the 80s was based in detroit. the statue of robocop would also bring more money and tourism to detroit from classic movie lovers. it would also be a memorial and honorable thing to all of the past present and future police officers of detroit say that they protect the city. They would want one in Detroit because that is where the movie was based at and that is where the statue should be. The statue is also a reminder to not making trouble of crime. The RoboCop pitch was for more fans and for them to make money i think. I believe that it helps bring more people in to games and to vacation too. That just seems out of the blue because it is a baseball game and they brought robocop in it? When they handed out those cards to the first ten thousand people it reminded me of when the minnesota twins did that with earbuds. 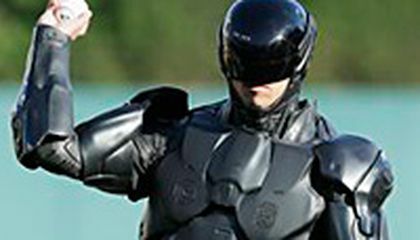 i think its cool that robocop is throwing the first pitch i mean the movie was good but they should have done this when the movie released. Robo Cop was at a tigers stadium and pitched out the first pitchers and then the Robo cop fans were all over the stadium, in my opinion I think it's col that he whoever up in public.